Next Monday commences the beginning of Winter Homecoming here at MHS and excitement levels will be at large thanks to the completion of exams last week! This year’s Snowcoming theme is Nursery Rhymes. While the Raiders duke it out on the court for a victory over the Ubly Bearcats, the students will be battling in the classroom for a spirit week victory for their respective class. As always, Get-Up-and-Go day kicks off the week allowing everyone to enjoy a Monday in the comfiest of attire. On Tuesday, dorks and geeks will rejoice for Nerd day. What Not to Wear Wednesday will break records for the most fashion laws to be broken in a single day. Thursday will be a trip as the student body dresses as tacky tourists, and Friday red and white will dominate. Accompanying each dress up day will be a lunchtime game. Tying into the theme, each game will correspond to a beloved nursery rhyme such as Little Bo Peep and Cinderella. Points will be awarded to the classes throughout the week for participation, top-dressed students, loudest spirit yell, victorious lunchtime games, and lastly, the best banner. 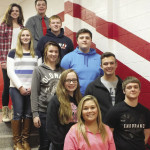 Representatives of each grade have been elected by their peers, along with, for the first time in Marlette history, not one, but TWO sets of twin crown bearers. Additionally, a senior court was elected allowing one more chance for two seniors to claim a homecoming crown. Following the basketball game on Friday, the class of 2018 will host a dance in the cafeteria. Blacklights will be hung around the room and refreshments will be sold, guaranteeing a memorable night! 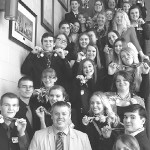 What a fantastic way to begin the second semester and make memories to last a lifetime!